Boltight, the specialist hydraulic bolt tensioning company, is exhibiting for the first time at Power-Gen International in Las Vegas, Nevada, USA. Boltight will be exhibiting in booth 3031 with parent company the Nord-Lock Group, a world leader in bolt securing systems. The show takes place 8th-10th December 2015 at the Las Vegas Convention Center. Boltight hydraulic bolt tensioning systems have a global reputation for innovation and quality. The company's products are used throughout the power industry for a range of critical bolting applications on steam, gas, diesel, nuclear, wind, hydro, and tidal power generation plant. Visitors to Power-Gen International will be able to see a selection of tools and hydraulic nuts at the show. There will be the Closure System, which is ideal for rotor clearance, distortion and alignment checks (tops on/tops off). It helps to save time and improve outage scheduling. Also presented at the show will be the Typhoon® multi-stage range. This delivers high bolt loads in tight spaces making it ideal for use in confined radial spaces on wind turbine tower connections and gas turbine casings. 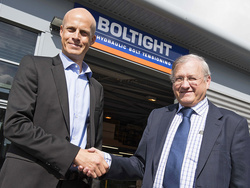 Boltight will also be promoting its foundation bolt tensioners. The range covers the majority of foundation and anchor bolts on wind turbines with just two different heads and modular bridge assemblies. "With over 30 years experience in the power generation market, we understand the special requirements of the industry. We work closely with major OEMs, utility companies and service contractors to deliver cost effective bolt tensioning solutions," says Business Development Manager Dave Metzger. "We are very excited about exhibiting at Power-Gen International for the first time. It is an important event in the power industry and it is great to be part of the worldwide Nord-Lock Group. We will be taking a selection of tools with us so visitors can see for themselves the strength and durability of our designs, which offer a long operating life and trouble free operation. Our team will also be on hand to discuss any specific customer requirements. We offer a quick turnaround on special tool designs for customer applications."